Driving Test Pass Rates by Age: Are Older Drivers Less Likely to Pass? In the pantheon of great driving debates, you'll find plenty of battles raging. In one corner, men and women viciously argue the case for their gender. Elsewhere, the different regions of the UK slug it out for dominance. Perhaps one of the fiercest rivalries, though, is the one between different age groups. Older and younger folk alike claim to be the better drivers—but who's right? 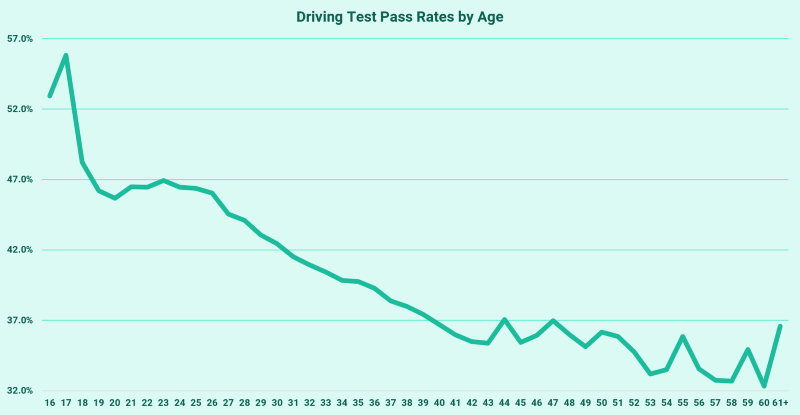 To figure it out, we decided to take a look at driving test pass rates by age. The age at which you have the best chances of passing your test is 17. In fact, pass rates for 17-year-olds stand at 55.8%. As such, those who make the decision to drive as soon as they're able to seem to have the right idea! There's a huge gulf between pass rates for 17 and 18 year olds, though, with the latter 7.6% less likely to pass. From here, the trend becomes a little smoother. There's little variation in pass rates between the ages of 19–26, with learners in this age range enjoying pass rates around the national average. After this point, pass rates enter a relatively steady decline for candidates up to the age of 43—for whom pass rates stand at 35.4%. Beyond this point, we see more statistical fluctuation. This is due to much smaller numbers of candidates taking their test at older ages. Of the ages for which data exists, 60-year-olds have the worst chances of passing their driving test: just 32.3%. That's a full 23.5% lower than the rates for 17-year-olds! You can also check out the progress of driving test pass rates by age in the graph below. Why are older drivers less likely to pass? It may come as something of a surprise that pass rates are lower amongst older age groups. Department of Transport figures show, for example, that 60–69-year-olds are involved in less than half the number of crashes than 20–29-year-olds. In fact, 23% of 18–24-year-olds crash within two years of passing their test. And then there's the matter of higher insurance premiums for younger drivers. The ABI found that, in fact, drivers between the ages 18 and 20 pay over four times the amount of 66–70-year-olds. Nonetheless, pass rates for older learners stubbornly remain lower than those of younger age groups. Why is this the case? We set out to investigate. It's a common trope that the older we get, the more cautious we become. This isn't to say, though, that there isn't some truth in it. In fact, differences in confidence between age groups can have negative effects for older and younger drivers alike. For older drivers, this overly cautious approach can have a negative effect when it comes to passing the practical test. That's because, while caution is a quality you will need to display on the roads, too much of it can result in driving test faults such as undue hesitation. Younger drivers, meanwhile, may initially gain some advantages from their more confident approach. However, this can often manifest itself as overconfidence when they actually get behind the wheel sans instructor—going some way to explaining the greater crash rate amongst this age group. The issue of confidence doesn't just come into play with a learner's first driving test. It also affects your ability to pick yourself up, dust yourself off, and get back in the saddle when it comes to trying again. It's for this reason that it's interesting to see how pass rates vary for each attempt by age group. You can see the detail in the graph below. A few things stand out here. For all age groups, pass rates are at their lowest for those taking 6 or more tests. But, interestingly, for the youngest age groups, pass rates are actually higher for 2nd–5th attempts than they are for the 1st attempt. This suggests that younger learners are able to see their first practical as a learning experience and settle into the routine of the test better on later attempts. The gap in pass rates between 1st timers and 6th+ timers is a relatively slim 1.6%. This is not the case, however, for older learners. By the time we reach the 35–44 age group, pass rates begin falling off on every single attempt, with a 9.2% gap between 1st-timers and 6th+-timers. For candidates aged 55 or older, the gap is 12.7%. In fact, for 55+-year-olds on their 6th+ attempt, the pass rate stands at an abysmal 27.3%. It may be the case that that lack of confidence has come back to bite these learners—and one fail sadly leads to another. As we age, our bodies change. Any number of these changes may affect the way we drive, from slower reaction times to deteriorating eyesight and hearing. Older people are also at a greater risk of conditions such as muscle stiffness and joint pain, which can make the act of driving more difficult. Those who have spent a number of years behind the wheel before reaching older age may be able to adapt to this gradually over time. Those who are just beginning their learning process in their 50s and 60s, meanwhile, may find that they're already at a disadvantage. Absolutely not! Though some of the traits common to older drivers may put them at a disadvantage when it comes to the practical test, road safety charity Brake has found that there is no specific age at which a person is unable to drive safely. Though it is true that drivers will need to reapply for their licence every 3 years after the age of 70, there's nothing wrong with carrying on driving as long as you like—so long as you're safe to do so. In fact, we're no strangers to helping older drivers pass their test. Take Richard, for example, who passed his test with us at the age of 70, and sits proudly atop our the list of our top ten favourite pass photos. Here at PassMeFast, we've helped learners of all ages get their licence. So, whether you're 17 or 70, we can help you get in the fast lane and pass your test within weeks! Check out our full list of course prices for more details, or read up on the driving tuition process by checking out the learning to drive section of the PassMeFast Blog.